The National Science Foundation has partnered with NBC Learn (the educational arm of NBC News) to release the "Science and Engineering of the 2014 Olympic Winter Games"--the latest installment in the Emmy Award-winning "Science of Sports" series. This enlightening 10-part video collection, narrated by NBC Sports' Liam McHugh, delves into the physics, engineering, chemistry, design and mathematics behind the world's foremost sporting event. The segments feature a variety of sports stories, as told by some of the world's top athletes and record holders, along with perspectives and innovative research from leading NSF-supported engineers and scientists. The series' diverse topics reveal how key engineering and science concepts and cutting-edge technology play an integral part in each athlete's respective sport and help maximize their performance at the 2014 Sochi Games. Jordan Gerton, a professor of physics at the University of Utah describes how Nick Goepper, a 2013 world champion slopestyle skier, will need to follow the laws of physics and rotational motion in order to nail his gravity-defying tricks in Goepper's quest for Olympic gold in this freestyle skiing event debuting in Sochi. Mechanical engineer Brianno Coller, a professor at Northern Illinois University, explains how engineers design the half pipe so that snowboarder Shaun White can get more air time and allow him to perform tricks. Long track speed skating is a sport that rewards quickness, endurance and skating prowess--attributes that define Shani Davis. At the 2014 Olympics, Davis will have more than his physical skills to rely on. He'll also be wearing what may be one of the most advanced competition suits ever engineered. Biomedical engineer Cato Laurencin, at the University of Connecticut Health Center, describes his pioneering work in tissue regeneration, a field of research that could help athletes recover faster from knee ligament damage, the same injury that will cause alpine ski racer Lindsey Vonn to miss the Sochi Olympics. 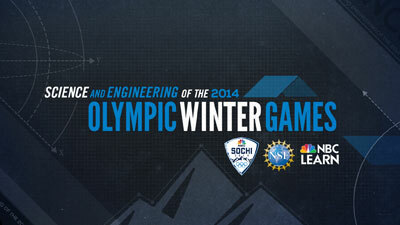 The science that makes ice slippery also makes the Olympic Winter Games possible. But exactly what is it that makes ice slippery? Ken Golden, a mathematician at the University of Utah, explains why the unique surface of ice enables the slide and glide of winter sports. Snow is an essential part of the 2014 Olympics. How it's formed and how it reacts has been studied by scientists for centuries and continues to this day. Sarah Konrad, a former Winter Olympian who is also a glaciologist at the University of Wyoming, along with Cort Anastasio, a chemistry professor at the University of California, Davis, discuss how humidity and temperature help form snow. Michael Scully, of BMW DesignWorks USA, and mechanical engineer Mont Hubbard, professor emeritus at the University of California, Davis, explain the engineering challenges associated with making sleds faster and tracks safer. Kam Leang, a professor at the University of Nevada, Reno, and Tom Watson, of Watson Performance in Hood River, Ore., describe how advanced materials and engineering help reduce unwanted vibration, optimizing the performance of athletes. Figure skating has become one of the most popular events at the Winter Olympics. Head of the Physics Department at the University of Michigan Brad Orr explains that good balance, or stability, is basic to everything a skater does--and that begins with understanding the center of mass. Professor Raffaello D'Andrea at the Swiss Federal Institute of Technology in Zurich, Switzerland, describes how control systems engineering is laying the groundwork for the design of more "athletic" robots.